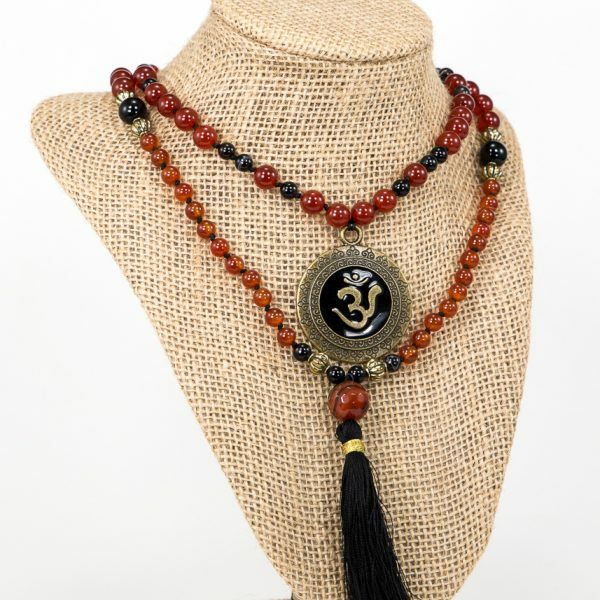 MALA-1 – This 108 hand knotted Mala bead necklace is handcrafted with Red Carnelian, Black Banded Agate, a Brown/Black Banded Agate Guru Bead, a Gold OM Pendant, Golden spacers, a Black silk nylon cord and a Black Satin Tassel. 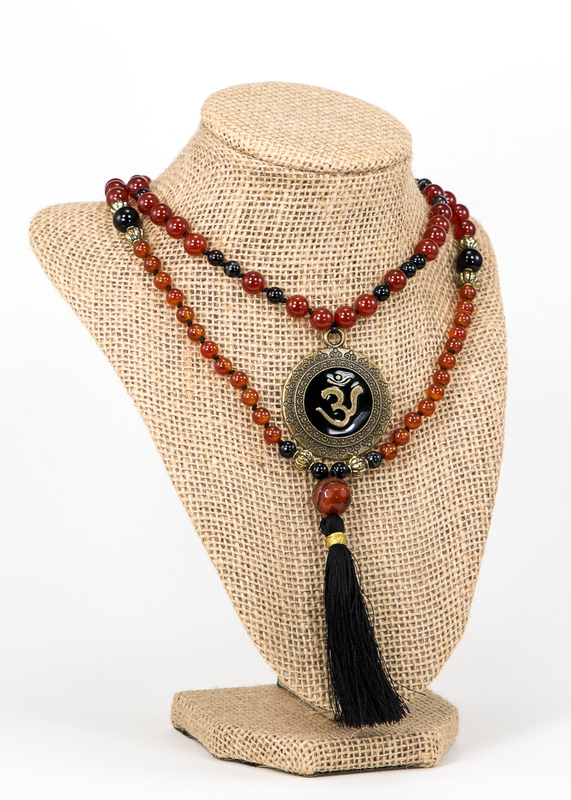 This 108 hand knotted MALA bead necklace is handcrafted with 40 – 8mm Red Carnelian, 24 – 6mm Red Carnelian, 4 – 10mm Black Agate, 30 – 6mm Black Banded Agate, 1 – 14mm Banded Agate, and for a rich statement this Mala is adorned with 10 Golden Spacers, an eye catching golden Pendant with an OM sign in it and a Black silk cord with a Black Silk Tassel. 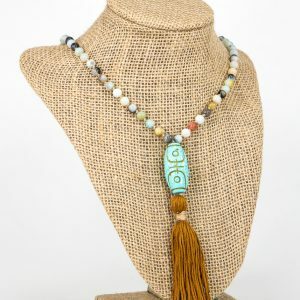 These beads have been specifically selected for their metaphysical powers as they receive their energy and power from nature itself. 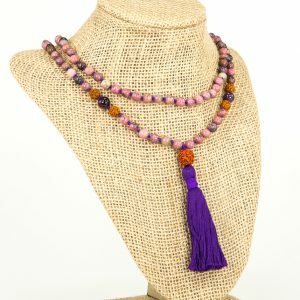 Makes a nice affirmation reminder necklace so you can focus and set your intentions by repeating them as you touch each bead on the strand. -CARNELIAN: Is a stabilizing stone with high energy. It will accelerate your motivation, and aid you to clarify your goals, so you can find your best direction in life. Is said to attract prosperity. Stimulates the Sacral Chakra. -BANDED AGATE: Is a Healing stone for body, mind and spirit. It can increase concentration honesty and memory. 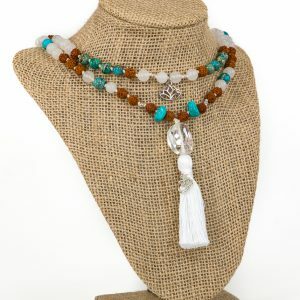 Protects the wearer from negative energies, stress and energy drains. Agate attracts Strength. If you require a longer tassel please include this request in the notes section when making purchase. In our designs the markers beads are counted in the 108 beads. If your item breaks due to normal wear and tear within 90 days of purchase simply contact me in order to send the item back for a free repair / restring. Buyers are responsible for return shipping costs. If the item is not returned in its original condition (beads/Charm missing), the buyer is responsible for any loss in value.